short girl, long island. : Revolution: The Replacement For Lost? While Erich was watching a video on YouTube, a commercial popped up. He had the option to skip it after a few seconds in, but it caught his attention. He called me over to watch it, and we sat there for a few minutes, in amazement. Since Lost has ended, Erich and I haven't found a show that we both religiously watch. Granted, I was a few years late to the Lost party, but once Erich introduced me, I was hooked. We had Lost marathons, then we would sit around and discuss what we had just watched. The last season brought lots of tears - remember the Jin and Sun episode? We have dabbled into other shows, but nothing has compared to our love of Lost. Now, after seeing the trailer for Revolution, I am hoping that this will whet my appetite for a gripping television series. JJ Abrams (executive producer of Lost, Fringe, and Person of Interest) is behind this series, along with director (yes, the actor) Jon Favreau and writer/producer Eric Kripke (Supernatural). The storyline is interesting, and is some strange way, reminded me of The Hunger Games. Not the love story fluff, but the idea of a country in upheaval. This will be in a prime time slot, so there will definitely be alludes to romance, but I hope that isn't the main focus of the show. From what I can tell, this will definitely operate in a Lost-like fashion, with a plethora of flashbacks. Even in four minutes, you can tell which characters will help carry the show. Giancarlo Esposito (Breaking Bad, Gospel Hill, The Usual Suspects) commands presence, even before he utters a word. Billy Burke, who most tweens will recognize as Bella Swan's law enforcement father, from the Twilight franchise, ditches his pornstache for some sweet sword wielding. Will Tracy Spiridakos be just a pretty face, or will she prove to be the Katniss-like heroine her father needs her to be? Only time will tell. With this show, there will be no grey area - it will either be a hit, or its going to flop. 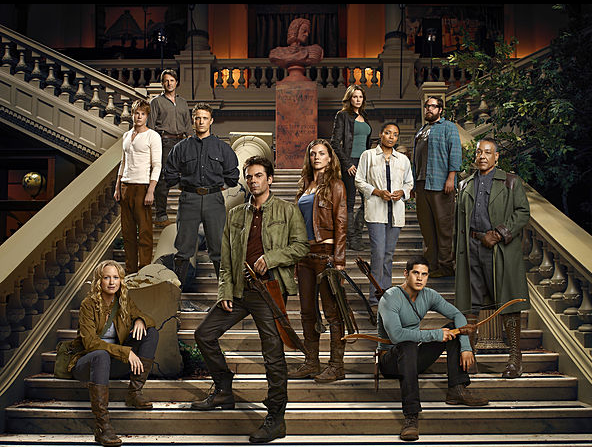 I'm hoping its the former, because the show, if done correctly, could quite possibly fill the void where Lost once was. Lost was mos def one of the best shows to ever be on TV. Many have tried to duplicate it but that show was something special. I am looking forward to this and I totally agree, it will either be a success or a flop!